We moved from Illinois to Florida in 2006 and brought along two "furkids"- our Miniature Pinscher, Nina, and our Boston Terrier Mix, Pancho. At the time, we lived in St. Pete and worked doing outside sales for the same company while traveling to Naples, and occasionally Orlando, on a weekly basis. With no family in town, we constantly had to juggle our work travel schedules to accommodate the dogs. While one of us traveled, the other would stay home and vice versa which meant many nights spent apart. We then began researching doggie daycare and boarding facilities throughout the west coast of Florida and Orlando. We visited a few, but only one made us feel like our dogs were truly loved and would provide a safe place they could play while we were gone. 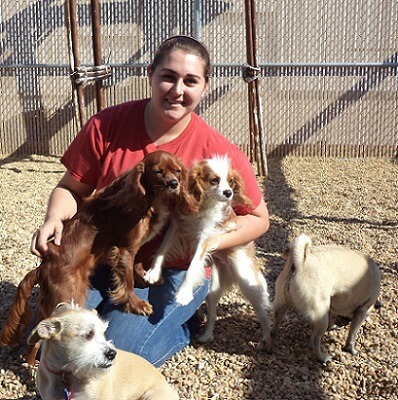 Nina and Pancho loved going to daycare and would wag their tails as we approached the facility. When we would pick them up, they would fall asleep instantly, exhausted from all the fun that had that day. This behavior eased our feelings of guilt and even allowed us to go on vacations without remorse. Everyday we visited the doggie daycare, we spoke of how wonderful it would be to own a similar facility. We had been able to dog sit from time to time back in Chicago and loved caring for other people’s dogs while they were away. One day, a veterinarian from New York and family friend, suggested we look into starting a Camp Bow Wow franchise, so we did! We opened our doors in October 2009 and were welcomed with open arms by the Naples community. In 2010, we launched our in-home pet sitting business. We wanted to provide clients with a reputable team of reliable sitters that carried the same values and love for dogs that we were known for. As a team, we are able to help each other out in the event of an emergency or in the event that a particular caregiver is not available. 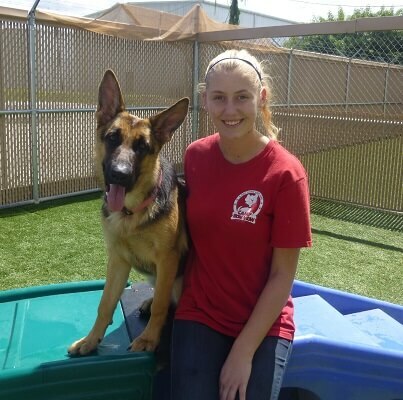 In January 2014, we partnered with Danielle Cavanaugh to launch our dog training program. 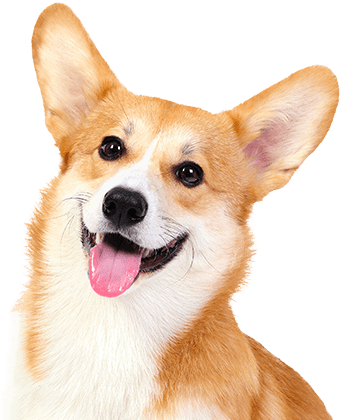 We want our customers to feel that they can rely on us for any of their pet care needs. Come by our camp and take a look for yourself. We hope to exceed your expectations and assure you that your doggy (or doggies) will be loved, pampered and safe while under our care! What I love most about my job: Our team! We've become a family! 11 of our team members have worked for us for over 4 years and a few others have been with us 1-2 years. It really makes a big difference! They know the majority of the dogs well. They don't just know their names, but their personalities, eating habits, medical conditions, etc. This helps point out potential health and comfort issues. Our dogs: While Nina is no longer with us, Pancho is still going strong! In 2012, we adopted Maya Papaya, a Puertorican Sato (just like her human mom) from the Humane Society of Naples and one year later, we found Pancho's doppelganger on PetFinder.com and named her Déjà Boo! Background: Worked at the Cheesecake Factory, Majored in Interior Design in college and I am child care certified. Additional Skills/Qualifications: Expert in gate management, certified in Pet CPR and First Aid plus I have had numerous dogs, cats, horses, birds, rabbits etc. What I love most about my job: Getting to play with dogs all day and getting to see them grow through the years. 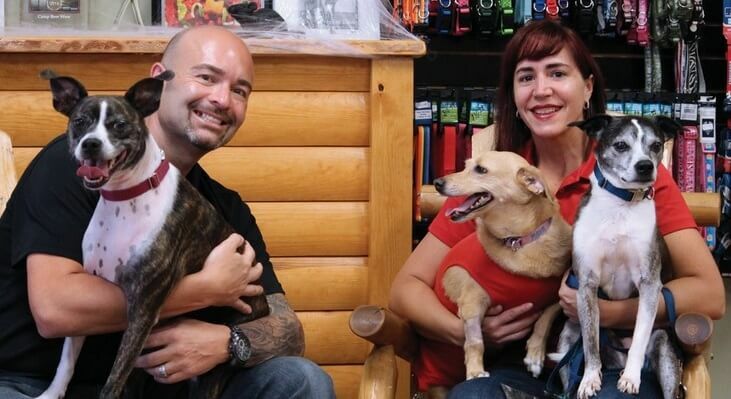 Background: I am pretty new to Camp Bow Wow although I have accompanied my husband Ira on some of his pet visits and we were customers before we joined the team. I owned a travel agency for over 30 years but decided in 2009 to go back to school. Additional Skills/Qualifications: I earned an AAS in Applied Science at Ulster Community College and I am a NY State Licensed Veterinary Technician. I have been working at Animal Health Oasis for the past 4 years. I love my job and have learned so much. Dr. Kordon is a Veterinarian that specializes in a holistic approach to animal care. This has really opened my eyes not only in regards to animal health but human health as well. What I love most about my job: My favorite part of working for Dr. Kordon and also Camp Bow Wow is I love the animals! 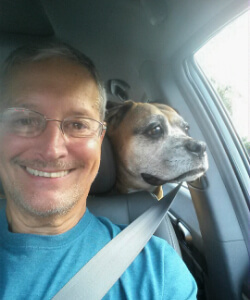 My pets: Ira and I have Nala the boxer and Leo the lion... I mean, chihuahua. We appreciate all the loving care they have received from Camp Bow Wow over the years! My pets: Holly (Berry), a gorgeous German Shepherd who loves Camp yet hates everything else! Background: R.C.A. Technical institute in NYC T.V. Production skills. I was a camera man at the original 1969 Woodstock Music Festival. Later learned post production and became a Colorist with a number of credits in T.V. shows and film features and Documentaries. You can find my credits on IMDB.COM! I worked in post production for 30yrs. Additional Skills/Qualifications: I worked part time in N.Y as a pet sitter taking care of all types of animals for 2 yrs prior to moving to Florida. What I love most about my job: What I love most about my job are the different types of animals I come across and the challenge of their needs. I also love all the people who I work for and the other employees who work at Camp Bow Wow. 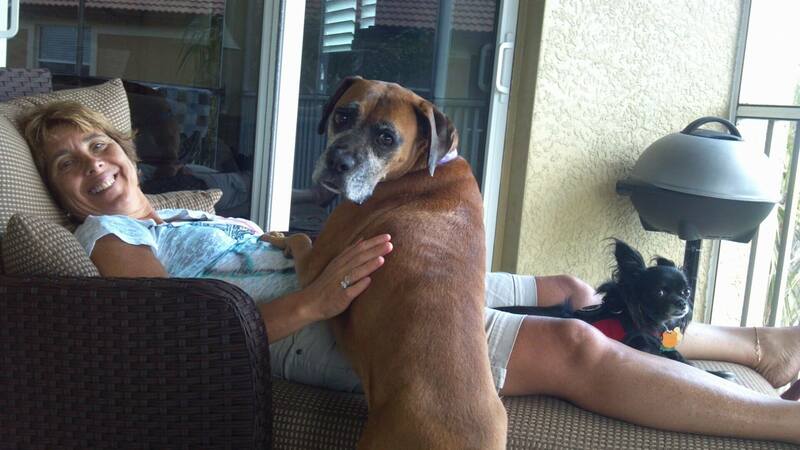 My pets: I have 2 dogs, a rescue boxer named Nala (11yrs old) and a Chihuahua named Leo (8yrs old).